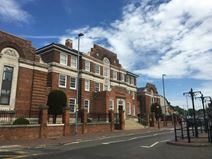 Located in Grays and housed in a renovated Post Office building, this centre offers flexible terms and a wealth of amenities for tenants to take advantage of. Offices range from 75sqft to 360sqft. Monthly costs include all utilities, internet, eight hours of meeting room use, and an onsite management team and reception service who are happy to ease your burden by taking care of photocopying/printing, post handling and other administrative support. The centre is close to a number of shops due to it's High Street location, and is just a minute's walk from the town's train station, which offers direct access to London Fenchurch station. Situated at the end of Grays High Street this office space has been recently refurbished in an urban-chic style, ranges from 79 to 1,098 sq. ft. and is ideal for young or growing businesses. All just a 30-minute drive from Canary Wharf and with good transport links to central London.